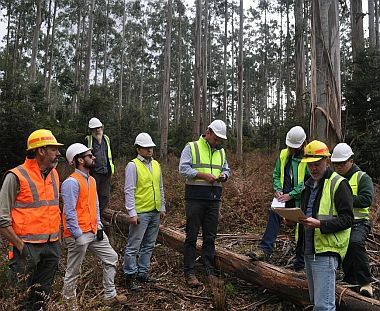 From germplasm to commercial buildings – the latest research supporting innovation in the forest industry across the entire supply chain will be presented to stakeholders during a roadshow across Tasmania in October. The research is the work of postdoctoral fellows and PhD candidates from the Australian Research Council (ARC) Industrial Transformation Training Centre for Forest Value, based in Tasmania. The Director of the ARC Centre for Forest Value, Professor Mark Hunt, said the roadshow is a great opportunity for broader engagement with stakeholders. “The roadshow allows our industry and partner stakeholders to get out in the field with our students and get a very hands-on update as to how the research is tracking,” said Professor Hunt. “They also have the opportunity to see closely some of the technology our students are using in their projects,” he said. There is an opportunity for interested parties across the sector to learn about the latest developments in research, at a presentation open to the public on Tuesday the 23rd of October.